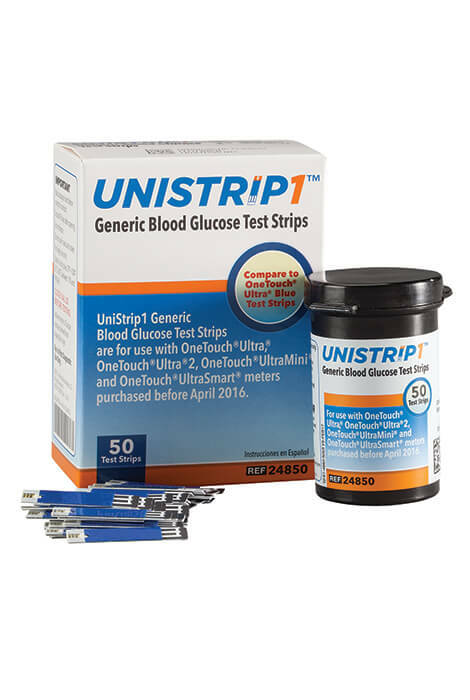 Wisely manage your health and your money with Unistrip™ Generic Blood Glucose Strips–a test strip designed to work with the most popular meters. If you have a OneTouch Ultra, Ultra2, UltraSmart, or UltraMini meter, these universal glucose test strips are an economical way to stock up. Approved for finger, palm or forearm testing, its capillary action automatically draws the blood sample into the strip and its glucose oxidase technology provides fast, safe, accurate results. Pack includes 50 strips.